I’ve never been a fan of cauliflower, so I have no idea what possessed me to buy a head of that white stuff. After staring at it for several days, and it not cooking itself, I decided to cook it up. 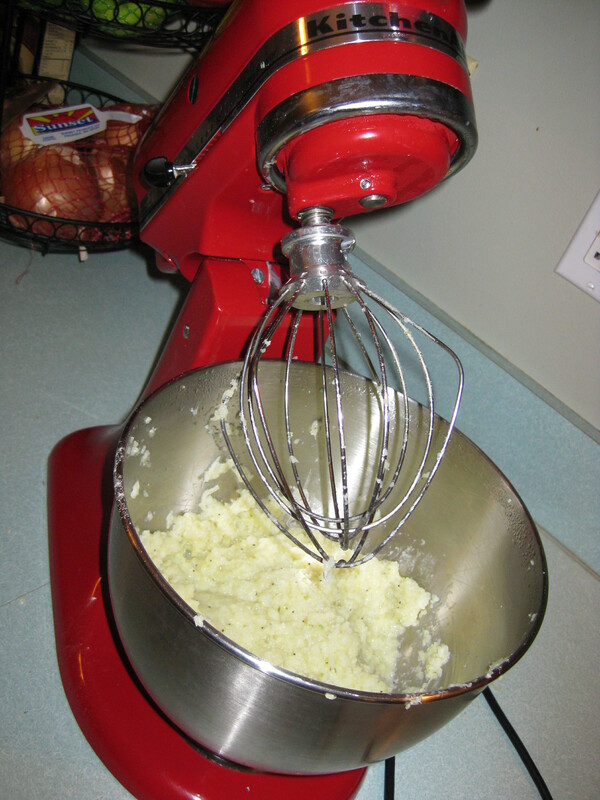 I keep hearing mashed cauliflower tastes just like mashed potatoes, but I’m not a believer. I decided to check it out. Now the point of me eating mashed cauliflower instead of glorious mashed potatoes is to eat fewer calories and pretend I’m being healthy. At least I think that’s what I was thinking when I bought the thing. So here’s where the “healthy” part comes in. I used the tongs to transfer the cauli to my mixing bowl. I added 1/4 cup of the cooking water (remember, it has chicken flavor in it) and put the mixer on low. 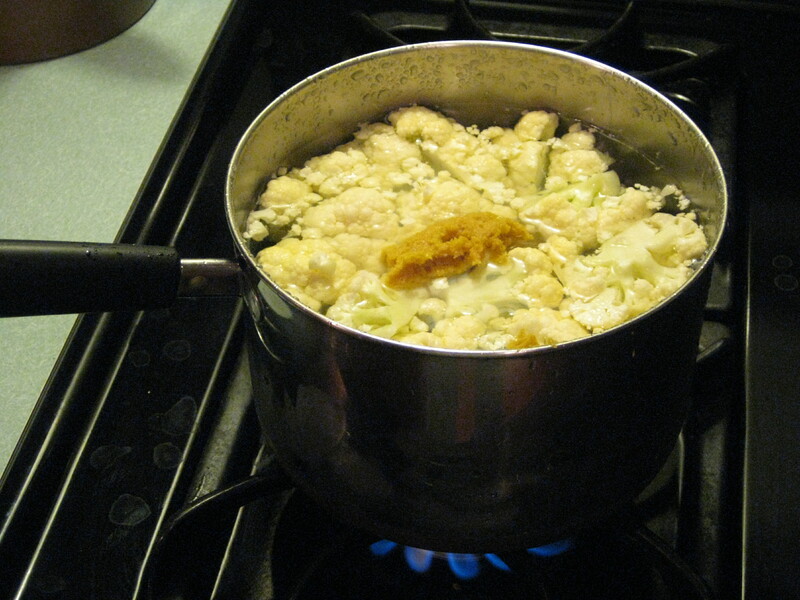 As the steam rose from the bowl, I caught a whiff — and remembered one of the reasons I don’t eat cauliflower. It stinks! I knew if I was going to actually EAT the finished product, it would require some seasoning. I have some Penzey’s spice mixes in my pantry that were just perfect. I added some Garden Salad Seasoning and some Fox Point Seasoning and kept mixing. Both seasonings are fairly mild, but would provide some great flavor to the cauli, as well as help mask that bitter smell. To make it a bit creamier, I added a little bit of butter. That’s it. No milk or cream, no excess of butter, very little fat. Nice and simple. Since I was serving the cauliflower with well-seasoned Italian Chicken Bundles (recipe to come), I only wanted to lightly season it. If I was serving this with something less robust, I would probably kick the spices up a notch or three. I realize not everyone has these particular spice mixes in their pantry, and that’s OK. You might have some other combination spice mixes that would work well with the cauliflower. Open your jars and take a sniff. If they seem like a good match, then add in a teaspoon or two. Start easy – you can always add more, but you can’t take it out! I’d also recommend adding a couple tablespoons of parmesan cheese, because cheese makes everything better! 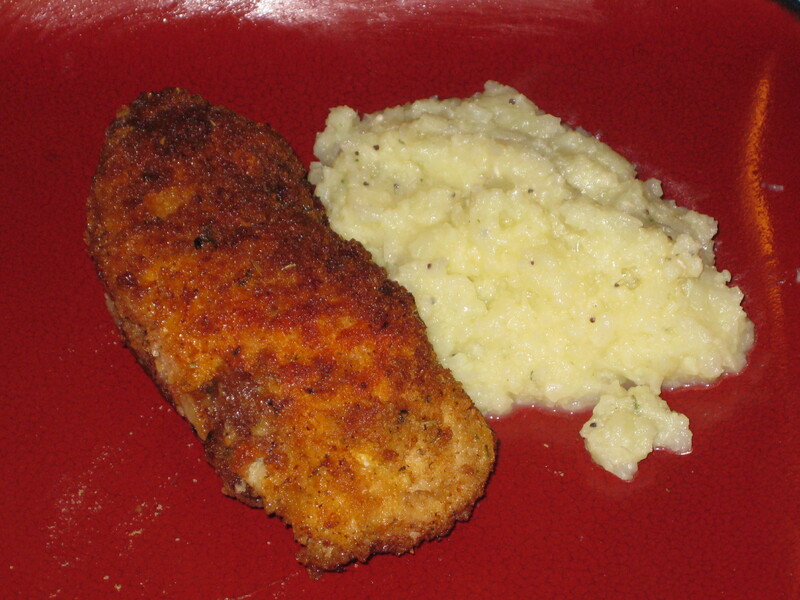 The finished product wasn’t as smooth as mashed potatoes, but might have been if I’d used my food processor. And in my opinion, it doesn’t taste “just like mashed potatoes”, but it was definitely edible. Score one for healthy eating! Now… what am I going to do with that crown of fresh broccoli? For the broccoli, two ideas: Put 1 tablespoon olive oil and one clove crushed garlic in a microwave-safe bowl with a lid, micro for 30 secs. Add broccoli and cook for 2-3 minutes or until crisp-tender! Second idea, Put 1 tablespoon sesame seed oil (LOVE this stuff) in microwave safe bowl with a lid, and cook per above!